Consumer Watchdog: Will we ever learn? Why do we keep falling for scams? Why, as a nation, are we serial victims to scammers? Maybe I’m being unfair. Maybe people only ever fall for a scam once and then they learn their lesson. Maybe each scam that hits Botswana only affects people who have never seen a scam before. Maybe each time it’s a new set of victims? If only it was that simple. Yes, each time a new scam arrives it finds some new victims but very often it’s the same people who fall for them over and over again. Some of us really are serial victims. Anyone in our Facebook group or who listens to us on radio will have heard us warning people about what appeared to be a suspicious recruitment exercise being undertaken by a company calling itself Voxcom Voice and Data Solutions. A letter from this company started with the following bizarre statement: “The world has never been a place where peasants have held power”. It then continued to welcome each “Prospective Employee” “to the Voxcom family” and confirmed that the recipient had been successful in their “application for a weeks training”. So far so good, you might think. Stop and think about that. A company that is offering a job to people (“Prospective Employee”) demands that they pay to be trained how to do the job while wearing particular clothes? Is that normal? Is that how recruitment works? No, it’s not. It most certainly is NOT how real businesses hire people. But it’s stranger. The logo on this letter was quite distinctive and with just a few seconds work on Google I’d found a company called Voxcom Voice and Data Solutions with exactly the same logo based in Maryland, USA. 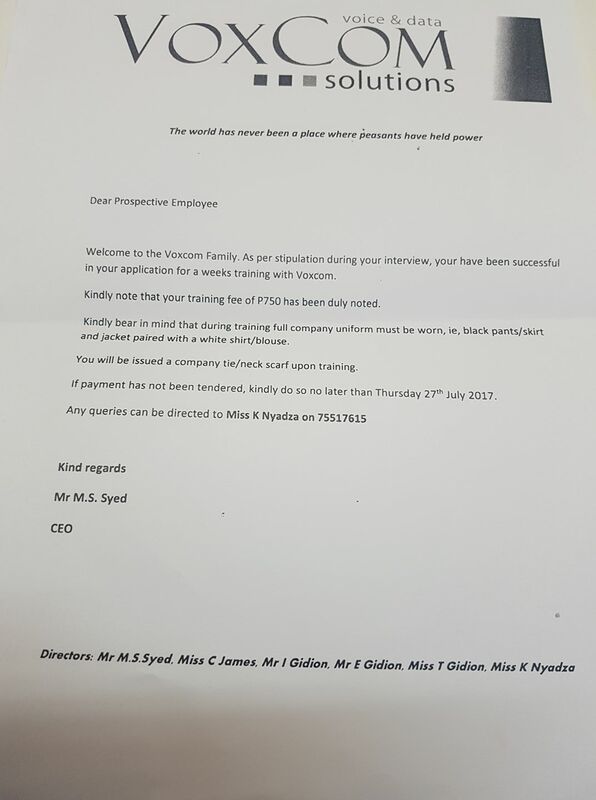 So I called them and asked if they knew anything about a company running a recruitment exercise in Botswana using their name and logo. No, they told me, they knew nothing about this. So now there’s a very good reason to be suspicious. After we posted and broadcast warnings several people got in touch to defend the program, saying that they had willingly paid the P750 because they were going to get jobs earning P2,500 in a call center that this company was establishing in Francistown. Some even sent pictures of the trainees proudly holding certificates they’d been given following the training. So was it perhaps genuine and just a bit strange? Was it all actually legitimate? Let’s not forget the issue of theft. The people running this program had stolen the logo and name of a company in a foreign country and while that might seem like a minor thing I think it tells you a lot about someone. But then the whistle-blowers got in touch. The good news is that this scam has already collapsed. The bad news is that the organiser appears to have stolen at least P75,000 from people, probably a lot more. The worst news is that we’ve fallen for a scam yet again and I don’t see an end to it any time soon. So when will we learn to be less gullible? When will we truly understand that there are many people out there whose only objective is to steal our money? When will we become a nation of skeptics? It needs to be soon!